We will do so in the form of new extension, lets say that the extension name is “Ajzele_Mapy”. First we will place the Ajzele_Mapy.xml file under the app/etc/modules/Ajzele_Mapy.xml with the content like shown below. Then we need to create appropriate file/directory structure inside the app/code/community/Ajzele/ folder. First lets create the app/code/community/Ajzele/Mapy/etc/config.xml file with the content like shown below. In the above app/code/community/Ajzele/Mapy/etc/config.xml file you will notice I overridden all (if I did not miss any) of the exposed Magento API classes. 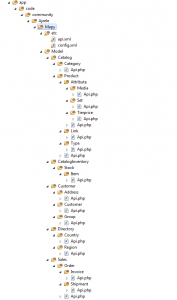 For example, definition Ajzele_Mapy_Model_Directory_Country_Api tells the Magento to use Ajzele_Mapy_Model_Directory_Country_Api each time it wishes to use the Mage_Directory_Model_Country_Api class which is exposed to the API. My appropriate Ajzele_Mapy_Model_Directory_Country_Api class would then have a content like shown below. This example merely overrides the Mage_Directory_Model_Country_Api class, not doing anything more at the moment. Now if I would like to add new public method (one that does not exist in the Mage_Directory_Model_Country_Api), then I would (with one extra configuration entry shown below) call that method trough API like "directory_country.myNewMethod". In order to do so, I would need to add one more config info to another file called app/code/community/Ajzele/Mapy/etc/api.xml. 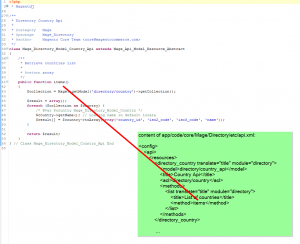 Careful study of the above file shows how Magento exposes its class and methods to the API. For example, is you open the app\code\core\Mage\Directory\etc\api.xml file you will see how it exposes methods for the Directory module. So, in short, my module merely overrides all the available/exposed API classes enabling you to add new methods or overwrite existing ones in the API. Entire code provided above does not contain any custom methods or does it overwrite any. Its merely an “empty” and “ready” project for writing your own stuff. I have taken this “extending the Magento API” concept very serious as I will most likely need it for my future Android – Magento apps. With that in mind I have created a repository on the http://github.com/ajzele/mapy (which is empty for now, planning on submitting my first code in a week or so). As you guessed it, the project name is Mapy, short from Magento + API + y to spice up the things :). How can we create an user, role and assign required resources at the time of plugin installation? How to get Size and image Url by using Array of catalogProductRequestAttributes (optional) in catalogProductInfo (SOAP V2) API in Android . Please provide some information regarding this API . I’d like to add a generic API to allow SMS sending to multiple customers. Where do i need to add this in the api structure (since it’s not customer/catalog specific) and how will i call it from the API ? Hey Julius, did you get the order API call working with PayPal? Maybe you coudl tell us your experience? I am getting paypal issue on magento soap api. With that fixed, all is well. I’m attempting to add a new api call, but I’m not having any success. Does this seem like the right procedure? I’m trying to add a new api call for adding options to a Dropdown attribute. I’m sure I must be missing something simple. I’ve cleared caches, and it’s no better. It is important that you don’t add on top of xml files, else your api won’t work. Cool stuff Branko, and hey, if you need an alpha/beta tester for your Android app, I’d be happy to try it on my HTC Desire :). @Alan Thanks for the tip/heads up. Think I’ll stick “mapy” to front of the method calls for existing classes, so call could look like “customer_address.mapyFindLatestFromState”. Basically I would like people to make an easy transition to using “Mapy” and built in Magento API. I know it sound like a lot of bs* … most of all I would like to write as less as little possible of new code :), thus override of existing and adding of new functionality. That makes sense. The core API seems to be one of the less Zend Framework-y aspects of Magento programming. Zend_Soap_Server wasn’t introduced until ZF 1.6; maybe that’s why they went the route they did? Useful information, although you’d be better off creating a new top level namespace in the API and adding all your methods to it. If the method name you choose is the same as the method name a future version of the API chooses there’s a slight chance of a collision with this setup. @Jonathan Can it get any slower than the current one? LOL… just kidding. Well, I would say the same. Basically I am just rewriting their stuff with mine, so it should all come down to Magento’s mechanism that checks the config for rewrites?! Also, please keep in mind that I still haven’t committed any code to the github repo, so no real stuff to test for now. Will do so in a few days. Any thoughts/comments on the performance of Mapy compared to the standard API? That sounds really cool – I’m envisioning a lot of possibilities with a REST API, especially with integrations to Rails webapps. I’ll keep an eye on Mapy. Great article! How difficult do you think it would be to create a REST API for Magento? Zend Framework supports it but I’ve never seen Zend_Soap_Server in Magento so it may be something that would have to be started from scratch. I’ve read your article about creating your own API, but how about reproducing the official API in REST?